Are you looking for the best diet food options for your dog? It is common for man’s best friend to have a bit of a weight problem. If not managed appropriately, obesity can increase metabolic abnormalities like cardiovascular disorders and diabetes. It can lead to a number of different health issues, which will reduce the quality of your pet’s life and shorten it too. What Makes a Food Great for Weight Loss? How Many Calories Does Your Dog Need? You can protect your furry friend from the complications of obesity by providing him proper food for weight loss. This dog diet food is low in calories and fat which will help your canine maintain a healthy weight and slim down. And to identify the best of the best, we have reviewed dozens of food for overweight dogs. We have focused on a range of essential features such as calorie content, ingredients quality, customer review, and value for money. If you want to know more about weight management dog food, all you have to do is read on. 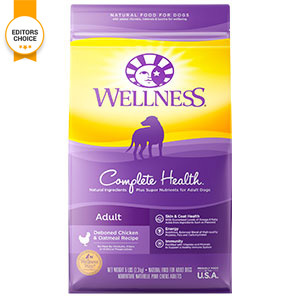 The Wellness Complete Health Natural Dry has many impressive benefits which make it our #1 favorite overweight dog food. It contains no fillers or poultry by-products, artificial additives and includes less fat than some other recipes. On the other hand, it is packed with whitefish, chicken meal, deboned chicken, and whole grains. That will provide your canine long-term energy and keep him feeling full for a more extended period. The most impressive thing about this weight loss dog food is the fact that it includes vegetables and fruits in its recipe. That will not only improve the taste of the meal and provide minerals and vitamins, but it will also provide your furry friend with antioxidants that will boost his immune system. Isn’t that great? Complete Health is designed to have an ideal balance of essential minerals and vitamins, carbohydrates, fat, and protein to support vitality and overall health of your pet. 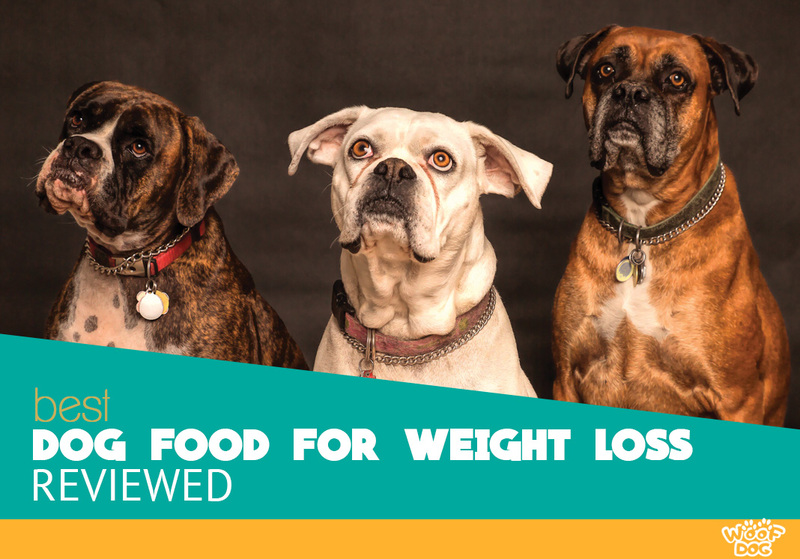 With fewer calories and less fat than the standard formula, this food for obese dogs is a fantastic tool for weight loss. Its grain free formula is perfect for canines with grain intolerance and allergies. This food contains plenty of protein which will keep him feeling full for a longer period. It is made with almost every dietary whistle and bell a dog owner could wish for and designed to satisfy all nutritional needs of your pet. Broccoli, carrots, kale, blueberries, parsley and other fruits and vegetables are included in this recipe to boost your dog’s immune system. And what we really liked is the all-natural formula that is free from all artificial preservatives, flavorings, and colorings. We need to mention that this isn’t the cheapest weight control dog food on the market, but it is worth the money if you can afford it. This dog diet food is an excellent choice to control or reduce your canine’s weight. But, not only is it good for shedding pounds, but it is also designed to taste amazing. And what ensures this great taste is the number of excellent fats such as cheese, chicken fat and salmon oil. This free of artificial dyes, flavors and colors food is full of nutritious ingredients. Celery, lettuce, and carrots are included to provide fiber, minerals, and vitamins. Although this recipe is slightly unusual, it includes common proteins that provide essential amino acids your pet needs to be healthy and strong. There are several proteins such as turkey liver, lamb, menhaden fish meal, chicken meal, and duck. Overall, you can’t go wrong with this food as it will help you to control or reduce your dog’s weight. And the best part is that your pooch will love its unique taste. NUTRO Lite dog food is the fantastic-tasting formula that helps obese and less active canines boost the immune system and achieve a healthy weight. 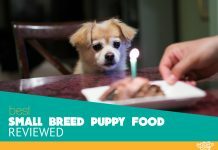 It features only the finest natural ingredients, and it is perfect for puppies with sensitive stomachs. The first ingredient in this low-calorie, nutritionally complete recipe is a grass-feed lamb. It doesn’t contain artificial preservatives, colors, and flavors. It’s important to mention that this dog food also features a mix of high fiber and protein to help obese and less active dogs feel full longer period and achieve a healthy weight. Also, this great-tasting natural food is designed using premium ingredients and formulated with B vitamins, Zinc, and Omega-6 Fatty Acid. That promotes shiny, soft coat and healthy skin. So, whether you’re looking for a dog food brand with guaranteed health benefits and high safety standards, NUTRO Lite is natural nutrition for a happy, healthy life. If you are looking for a quality reduced calorie dog food that is also affordable, then you should consider Blue Buffalo Life Protection Formula Natural. It is an excellent solution for pets who need to lose and maintain weight. The first ingredient in this recipe is fresh deboned chicken, followed by a blend of whole grains, veggies, and fruits. The great thing about this recipe is its authentic addition LifeSource Bits that includes a healthy mixture of minerals, vitamins, and antioxidants. It supports proper oxidative balance and a healthy immune system. You can be sure that you won’t find any artificial preservatives or flavors, nor soy, wheat, corn or by-products in this recipe. Overall, this weight control dog food is an excellent investment if you need to reduce your pooch’s weight. It is one of the lowest calorie food available. Every pooch has a healthy weight range associated with his breed. But, if they gain too much weight, it could lead to health problems and reduce the quality of your pet’s life and shorten it also. Since the body of overweight canines have to carry more weight than they are supposed to support, about 25% of them develop joint pain. This can lead to increased susceptibility to strains and sprains, exacerbate problems like hip dysplasia, and arthritis. In some cases, if the issue is bad enough, the dog will need surgery. The muscles, joints, bones, and ligaments are working together to give the dog an efficient and smooth movement. Dogs who are corpulent puts stress and strain on these particular areas. And when the body of your canine is required to carry heavy weight, it will put pressure on the joints that can cause osteoarthritis. That will lead to issues in mobility associated with painful and inflamed joints. Obese pets tend to have hypertension (increased blood pressure). That means that the dog’s heart needs to pump additional blood to excess tissues. And because it has a work load that is increased, this problem could lead to congestive heart failure. Obesity is a significant risk factor in the development of steatohepatitis or fatty liver disease. The main problem is that the liver cannot metabolize a lot of chemicals and foodstuffs that your pet eats. If it is not treated right, this problem could lead to end-stage liver failure, liver cancer, and ascites. Diabetes Mellitus is a condition where the canine’s body cannot use a type of sugar (glucose) normally. In diabetes that is caused by obesity, the pup’s body either cannot respond adequately to the insulin made by the pancreas or can’t produce enough insulin. If left unchecked, this can cause impair kidney function, nerve problems, and shorten your pet’s lifespan. There are plenty of reasons why your pet can gain those few pounds. The good news is that the majority of these reasons can be prevented, while some others are the results of chronic health issues. The food we provide to our dogs sometimes includes a lot of calories. They are coming from fats, proteins, and carbohydrates. Often, we are not sure how many calories our dog needs to maintain a healthy weight. This ingested energy must be used properly, or it will be used to create fat. Weight gain can be caused by no exercise at all or too little. You need to bear in mind that the food is energy intake and the physical activity is energy output. If your canine is eating too much, you need to increase its exercises. Otherwise, he will gain few pounds. Causes of Sudden Unexplained Weight Gain in Dogs? Rapid weight gain is usually caused by a medical condition rather than too little exercise and too much food. These can include hypothyroidism and Cushing’s disease. Hypothyroidism is prevalent among Doberman pinschers and Golden Retrievers, and it is characterized by weakness, exercise intolerance, hair loss, infection, and lethargy. On the other hand, Cushing’s disease can lead to increased cortisol production which causes obesity. It is a normal condition that canine’s metabolism slows with age. When they reach certain years, they begin to gain weight more easily. Older pets are not as active as younger pets are, which leads to obesity. So, it is not strange that these dogs are having a problem with overweighing. Dachshunds – Too little exercise and too much longing can quickly lead to obesity. This breed is also prone to Cushing’s disease which leads to overproduction of cortisol and increases appetite and weight gain. Labrador retrievers – Labradors have a genetic variation that makes them predisposed to food-seeking behavior and corpulent. They are prone to diseases such as hip dysplasia and arthritis. Rottweilers – Rottweiler is a large dog that is often raised to be even bigger as a police or guard dog. They pack on pounds easily. The more burden their body needs to support, the worse for their bones, which increases the risk of the osteoarthritic condition. Dogs who take some medications can quickly gain weight. The drugs can increase their appetite and reduce metabolic rate. That will cause them to store the energy they are consuming as fat which will lead to obesity. For example, Corticosteroids can cause pets to begin running less and eating more. Some dog owners allow their pets to eat whatever they want, not thinking about the consequences. They are providing them with more calories than canines could consume. And as we already have mentioned, the more calories your dog gets, the more weight he will gain. Some dogs are just inactive, or their owners don’t have enough time to take them out and provide them enough exercise. And pets who don’t play, jump or run won’t burn the calories they are consuming. Not only that can lead to obesity, but it could also lead to depression. Neutered and sprayed dogs, as well as older dogs, generally require more exercise and fewer calories to maintain a healthy weight. After altering your canine, they tend to have lower energy requirements than intact pets. Them means they shouldn’t eat as many calories as they consumed before. There is a lot of diet dog food available on the market today, but that does not mean you shouldn’t be careful when choosing the right one for your pet. You need to pay attention to some things when selecting this food. When you reduce the number of calories that your pet takes, his body will minimize the tendency to store them as fat. Any food that features decreased fat levels and increased protein level is designed for weight loss. So, when you are choosing the right food for your pooch, pick the one with reduced calories. To maintain and reduce the weight of your dog, you should always look for the food that contains probiotics. They are beneficial bacteria that will help your pet’s metabolism to operate effectively. That means your dog will be able to digest foodstuff adequately and it will be less likely to gain weight. To prevent overweight, you need to provide your dog with food that will keep him feeling full more extended period. You can accomplish this by increasing fiber in his diet. It will take up plenty of space in the gut of your canine, and it contains very few calories. If your canine is overweight, you want him to preserve muscle mass while losing fat. Well, protein is essential to the growth and maintenance of skeletal muscle, which is vital for mobility. It also breaks down more energy in your pet’s body than carbs or fat, so protein might even be more beneficial for weight loss. Below-average calories are one of the most important characteristics of a quality dog diet food. And what you need to know is how much calories your pet can eat on a daily base. If you want to know how to check for the calorie requirements, stick with us. Take the weight of your pup in kg. Multiply it by 70 and then again multiply it by the RER constant (Resting Energy Requirement) of 0.75. To obtain your pet’s MER (Maintenance Energy Requirement) multiply his RER by the proper multiplier that depends on its classification. So if you want your canine to lose some weight you need to provide him no more than 525 calories per day. How can you slim down your super-sized dog, reduce his risk of developing many serious diseases and keep him fit, other than diet? Well, the answer might be easier than you think. Jogging or walking is the best exercise, not only for your pet but for you also. By developing this exercise routine, you will undoubtedly increase your pup’s overall health and improve his metabolism. You can combine exercises with playing fetch or just being active with him and his toys for at least 20 minutes a day. But if your dog needs more time for exercise you may think about purchasing one of the best automatic ball throwers. As we already have mentioned, exercise will improve your canine’s weight, metabolism and muscle tone. You could start with short walks and then gradually increase the speed and distance of the walks, depending on what your furry friend can tolerate. In our opinion, walking is a simple and best way to implement an exercise routine, but you can choose any other outdoor activities for your dog. Giving treats to your dog, other than for training, is not critical – and that rule applies for any large or small dog. If you want to give him a “treat” after exercise or training, bear in mind that it should not be bigger than the nail of your finger! The best way to determine how much treats you can give your dog throughout the day is to weigh out the daily “ration” and set aside a few dog biscuits from that. Obesity in pets is a serious problem that you mustn’t neglect. There are many medical conditions that can undermine their quality of life and overall wellbeing. If your dog also suffers from obesity, switching to a low-calorie dog food would be the best way to help your dog lose a few pounds. Bear in mind that keeping him at a healthy weight requires a delicate balance of exercise and diet. Whatever dog food you choose, make sure you always go with the highest quality. Always take your vet’s advice and give your pup plenty of exercises.